The Surf in Weligama is proper the whole year for Surf Beginners good for a nice walk, safe for swimming, a wonderful spot to soak up the sun and watch the sunset. The most famous Surf breaks Lazy Left, Ram´s Right, Plantations, Coconut Point can be reached in a three sh drive within 5 minutes. Places you can see such as tea plantation, Whale and Dolphin watching, Safaris, boat ride, temples, snake farm, herbal garden, snorkel with sea turtle. 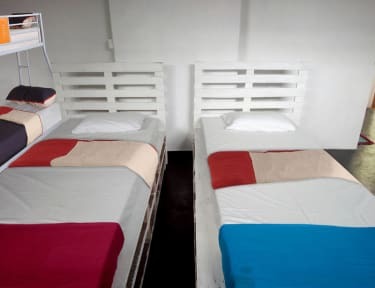 We offer dorm and private room. 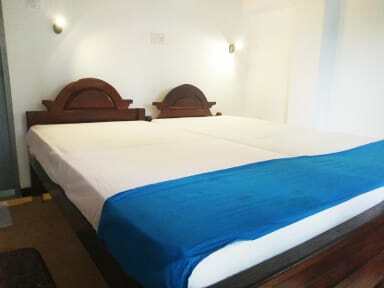 Clean and comfortable beds, cozy environment and fun atmosphere. We arrange surf lesson, yoga and cooking classes, Ayurveda massage treatments, bike rent is available on site, tours and also we rent different size of surf board that's suit to you. Reception hours 8.00 am to 9.00 pm. Unserer beste Unterkunft! Alles war sehr familiär und wir wurden mit offenen Armen empfangen. Nana hat super essen und smoothies gemacht und man konnte super abschalten und zur Ruhe kommen. Perfekter Ort zum Surfen!! Alles war fussläufig und falls nicht hat widu uns gerne gefahren und auch viel gezeigt. Sind hier 5 Nächte geblieben und würden es immer wieder tun!! Very very nice stay. Lovely people and a great place. Nana is an awesome cooker!! We stayed 5 nights and it was a wonderful place! Weligama was the first stop on our journey through Sri Lanka, we wanted to stay for just 2 nights, but stayed for 6 nights in the end because everything was so nice! The hosts Widu and his family are the most welcoming people, they're really nice and they made our stay really really comfortable. Nana made sri lankan breakfast in the morning, which was totally awesome and Widu became our friend. It was one of the best guest house I've ever been. The host family is so polite and heartful, so they made me feel like a part of the family. Also my room was very nice and clean. The location is perfect, because in a few minutes are you at the main surf beach. I just want to say thank you for the best Banana lassi in Sri Lanka :) and thank you for a beautiful time at this wonderful place!